Assistance dog week is about recognising the hard work and effort put in by assistance dogs on a daily basis; and appreciating the new lease on life they give to those they assist. Assistance dogs are not just a companion; but a carer. The person needs to put so much trust in their assistance dog, just to do the daily activities that most of us take for granted! I know from being led around an obstacle course, by a brilliant guide dog, at a dog show; trusting this assistant dog to keep me safe, was really hard. Obviously time builds up trust; but having the courage to put your trust in these assistant animals is something the people they assist have to do. Once the bond and trust is established, it’s well worth it (at least in my opinion)! Guide dogs assist blind people; they learn how to think of leading around, and looking out for, a person – someone a lot taller than themselves. Obstacles that the dog could easily manoeuvre has be thought about by the dog from a human point of view; can my human navigate this obstacle? If yes, they will proceed. If no, they will find an alternate route. Knowing hazards and dangers that we take in the stride of daily life, need to be learned by the dog. Knowing the daily activities, that would not normally pose a hazard in daily life, need to be learnes how to navigate. Things such as; knowing when it’s safe to cross the road, standing a safe distance from the edge of a train platform, knowing how to get to and from home from various locations, and much more. Mostly it is the Labrador that takes on this role, also commonly used is the Alsatian. For blind people with allergies to dog fur, the Labradoodle is being considered, as it does not moult. 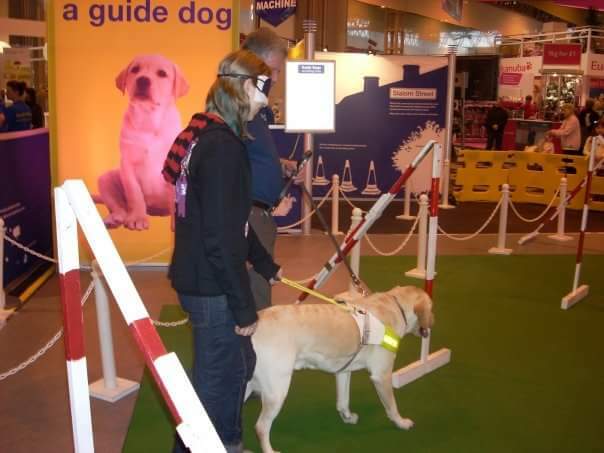 Guide dogs wear bright yellow harnesses with a metal bar for the blind person to hold, when the dog is working. When a guide dog is just on a lead, it knows it’s off duty for the time being. Hearing dogs assist deaf people around the home, and out and about. Hearing dogs learn various visual displays to signal different noises – the deaf person needs to learn what signal means what, so the lesson can take the appropriate action. For instance, the signal for the doorbell going and the signal for the fire alarm going off – not 2 signals you want to mix up! Hearing dogs wear a plumb/ purple harness with a lead. Most commonly, hearing dogs are (Cocker) Spaniels, due to their brilliant hearing. However, the Cockapoo (Cocker Spaniel x Poodle) is increasingly being used these days; beneficial for deaf people with dog allergies, due to not moulting. Dogs for the disabled can be any breed really; often larger breeds such as, Labrador or Golden Retriever as larger breeds can reach things higher up. However, your pet dog can become a Dog for the disabled, if you suddenly require one, and would prefer your current companion; the smallest I have seen in this instance was a Miniature Poodle. Dogs for the disabled do everything required for the person; from helping with the shopping to helping with laundry to just opening a door. There is no doubt how much these dogs help and enrich the lives of those they assist – and we’ll worthy of a week of recognition! This Assistance Dogs Short Documentary video is part of a documentary, which just gives a better idea of how assistance dogs help the lives of those they assist. This is not my video; the link is to a public YouTube video.